The 100+ Women Who Care Hilton Head Island made an impact once again in their community. This time, they were at Memory Matters to present their third-quarter collective donation. This local not-for-profit center supports families living with dementia by providing active day programming for participants and offers related caregiver respite. The gift bag of checks given to Memory Matters totaled and enabled them to purchase all new furnishings and necessary equipment for the newly built room which houses the Connections Program. This program expressly serves people newly diagnosed with memory loss. Many of these participants are women in their 60's who are grappling with declining cognition. "We can really feel where our donation went" said Ann Tucker and Jackie Ryan, co-founding members of the 100+WWCHHI chapter, as they "road tested" one of the many antimicrobial vinyl chairs purchased. 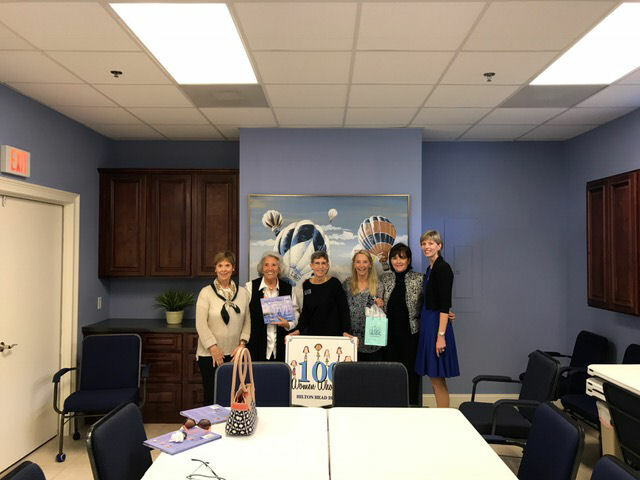 Two other members, Lisa Medford and Barbara Popovsky, joined Sheila Strand, Executive Director of Memory Matters and Sarah Coffin, Board President for the gift bag presentation and tour of the facility on Wednesday, February 8, 2017. Thanks to the 100+Women Who Care Hilton Head Island, the people dealing with this difficult diagnosis have benefitted enormously.